The kitchen garden is laid out in a series of beds on the side of Bakers Hill. 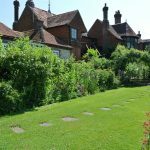 We know from Gilbert White’s ‘Garden Kalendar’ that he grew fruit and vegetables in various parts of the garden including the far end of what is now the main lawn. The kitchen garden is sheltered by the surrounding hedges of field maple, hazel and hawthorn and also benefits from being on a sunny slope. Vegetable crops in the kitchen garden are grown according to a rotation scheme so that the same crops are not grown in the same area each year, avoiding a build up of disease and pests and allowing the soil to maintain its fertility. Each year one of the large compost bins in the gardeners area is emptied and spread over the beds in the kitchen garden, together with the spent manure from the hotbeds. We concentrate on growing vegetable crops that can be used in the museum kitchen so that the kitchen garden is a working garden as it was in Gilbert White’s time, so large amounts of space are devoted to growing onions, potatoes and leeks that can be used for soup making throughout the winter as well as salad crops for the summer. The gardeners area has an insulated produce store set up for storing fruit and vegetables throughout the year. 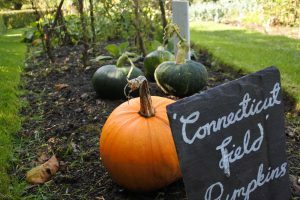 The vegetables grown in the kitchen garden are as close as possible to the ones grown here in the 18th century, including ‘Green Windsor’ Broad Beans and ‘Painted Lady’ Runner Beans. 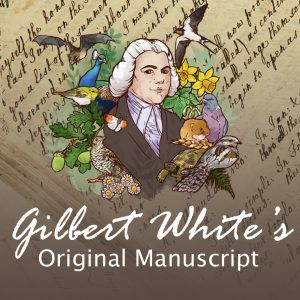 As Gilbert White kept such detailed notes on his vegetable planting it is possible to exactly replicate his crops in some cases. Wherever possible seed is collected and stored for use in the following year. A large part of the kitchen garden is dedicated to growing soft fruit which is made into preserves for sale in the museum shop. One of the compromises we have to make is in terms of crop protection, particularly from deer. We have had some success in producing our own hand made netting from linen twine but it is very time consuming and only lasts for around three years of use, necessitating the use of plastic netting to protect crops such as raspberries and strawberries.